What happens when indie bands hit the road They get hungry! Food writer Kara Zuaro knows a lot of musicians, and she's found they all share one obsession (besides music, of course): eating. Whether theyre on the tour bus reminiscing about meals past or at home in their own kitchens, theyve all got favorite recipes -- and theyre willing to share. This uniquely irresistible cookbook collects contributions from more than 100 artists, including indie icons like the Violent Femmes, Belle & Sebastian, and They Might Be Giants; current favorites like Franz Ferdinand and My Morning Jacket; and up-and-coming acts like Catfish Haven and Voxtrot. a box of graham crackers!!! You get the idea. 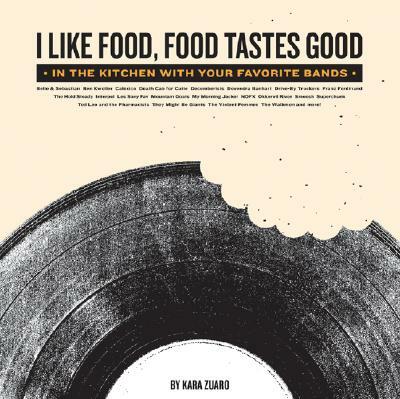 Part indie music discovery guide, part foodie fantasy, and all fun, I Like Food, Food Tastes Good is a cookbook for anyone whose iPod is always on. Kara Zuaro is a Brooklyn based food, music, and travel journalist. She is the editor in chief of The Brooklyn Record: www.brooklynrecord.com and has written for Epicurious.com, CMJ, New York's L Magazine, California's OC Weekly, Citysearch.com, DIW, 'Sup Magazine, and Basement Life.